Of course, very few places have a plate reverb anymore because they’re gigantic and expensive and software effects are small and cheap. That doesn’t mean a plate reverb is made of unobtanium. [Leo] just made his own plate reverb out of Ikea shelves and some simple electronics. This build used an Ikea Bror shelving unit that cost about $50 sans meatballs. The electronics are a surface transducer and two piezo pickups. Total cost was about $100. That’s all that’s needed to put this plate reverb together, but the real trick is making it work as a reverb. The plate is driven by the audio output of [Leo]’s computer, through a battery-powered amp, and into a transducer. The transducer is then simply placed on the metal shelf. The two piezo pickups are placed on either end of the shelf, with one going to the right channel of one input, the other going to the left channel of the same input. From there, it’s a simple matter of using this Ikea shelf in an effects loop. From the video below, the setup absolutely works. [Leo] is playing a few drum loops through the reverb, and the results sound like they should. There’s also a neat trick in using a shelf as a reverb; by placing a rag or a cardboard box on the shelf, the reverb is dampened allowing you to ‘mix’ this reverb in real time. That’s what happened when [joekutz] got his hands on this exceptionally juvenile keyboard toy. In its original state, it was so janky it couldn’t even reliably detect two keys being pressed at the same time; sort of a problem for a keyboard. So he decided to pull it apart and use it as a circuit bending playground. Thanks in part to how much free space was inside of the case, he was able to pack in a number of interesting modifications which he’s kindly detailed on Hackaday.io. [joekutz] started by adding a headphone jack to the device, as well as a switch to disable the keyboard’s speaker. That allows not only listening to digital jams in private, but makes it possible to capture high-quality audio when connected to the computer. He then started poking around the PCB with a resistor and listening for changes. When the pitch of the keyboard changed, he soldered a potentiometer into its place and now had a way to adjust it on the fly. Of particular note is the clever physical reverb he came up with. A microphone and speaker are connected to each other with a spring made out of an old guitar string. Audio from the keyboard’s PCB is played on the speaker and a TDA2022 low-voltage amplifier boosts the signal from the microphone. The end result is a very cool ethereal metallic effect. If you’re looking for a slightly larger DIY reverb, we’ve covered a few builds in the past which should give you some inspiration. You might want to check the dumpster behind the abandoned local Toys R’ Us for some donor keyboards while you’re at it. [Telegraphy] needed a reverb for his recording studio. There are hundreds of computer-based and standalone digital reverb systems out there, but he decided to build his own plate reverb. Reverb is an effect used in many professional audio and music recordings. Reverb adds thousands of echos to an audio signal. These echos decrease in amplitude over time. When used correctly, the effect is generally very pleasing to the ear. 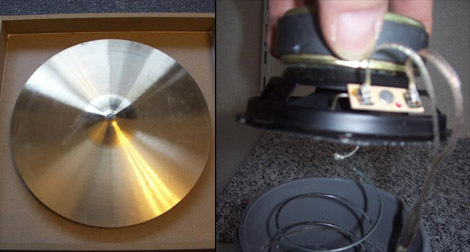 A plate reverb uses a plate of sheet metal to generate the reverb. An audio driver is placed in contact with the metal plate. Audio is fed into the driver, which vibrates the plate. The vibrations travel along the surface of the plate, bouncing off the edges and reflecting back. These reflections are captured by a pickup, which then converts them to a voltage signal. The final reverb effect is actually created in the sound engineer’s mixing board when the “dry” source signal is mixed with the signal returned by the plate. [Telegraphy’s] plate reverb was built almost entirely from found, Radio Shack, and hardware store parts. The plate and frame are from Lowes. The audio driver is a cut up speaker from an old car stereo. The pickup is a modified piezo transducer from Radio Shack. As [Telegraphy] states several times, there are a lot of differing opinions on exactly how and where to mount the various parts of the reverb. Any placement will generate some reverb. The question is where and how to mount things for the best effect. Much like beauty and the eye of the beholder, the answer to that question is in the ear of the listener. Jump past the break for a tour of a slightly more involved plate reverb at Gallery Acoustics Studio. If you’re running your own recording studio, you’re going to need a lot of gear that seems excessively esoteric to the non-musically inclined. A rack full of synth gear looks just like any other cabinet of technology you would find in a server room. Electronic music is, for the most part, very utilitarian looking, but there are a few pieces that add a very nice aesthetic touch to any studio. [Peter] made two great looking pieces of hardware – both reverbs – that significantly add to the decor of his studio. As a bonus, they also sound really good. [Peter]’s spring reverb (Dutch, Google translate) works just the same as any other spring reverb; a speaker puts some music into a slightly stretched spring, and this sound is picked up by another transducer at the opposite end. For this build, [Peter] used a Slinky and a piece of PVC pipe left over from a bathroom remodel. Adding a few jacks, pots, and a preamp, [Peter] had a very nice and extremely large spring reverb. The plate reverb (translation) is also a staple of pro recording studios around the globe. This reverb is somewhat similar to a spring reverb, except the spring is replaced with a tuned metal plate. [Peter] used a cymbal from a drum set for this piece of kit. Two speakers are attached to the back of the cymbal, one feeds a sound into the cymbal, the other speaker picks up those sounds and sends it to the mixing board. There’s a lot of really cool musical DIY projects over on [Peter]’s site, along with a few audio demos for each of his DIY projects. We’ve included his reverb demos after the break, feel free to give those a listen. Thanks go to [geekabit] for sending this one in.